Providence freshman Ross Mauermann (Janesville, Wisc.) scored the game's only goal, seven minutes into play, to upset the second-seeded River Hawks in game three of the Hockey East Quarterfinals on Sunday evening at the Tsongas Center. It marked the first time in Hockey East history that a seventh-seed defeated a second-seed in the Quarterfinals. UMass Lowell now sits at 23-12-1 overall this season and will await the announcement of the NCAA Tournament field on Mar. 8 to see if its campaign will continue. The Friars (14-19-4) will go on to the TD Garden for the Hockey East Semifinals next weekend for the first time since 2001. Providence controlled the opening portion of the game, capitalizing with the game's lone goal at seven minutes into action. The Friars' Barrett Kaib (Pittsburgh, Pa.) and Alex Velischek (Kinnelon, N.J.) cycled from the points and Velischek hammered the puck. Floating to the goalie's left, Mauermann tipped the shot through Doug Carr's (Hanover, Mass.) legs for his 10th tally of the season. One of the best scoring opportunities for UMass Lowell came while it was shorthanded in the second period. Zack Kamrass (Atlanta, Ga.) broke up ice after a long rebound and laced a shot off of the goaltender's waffle pad, nearly sneaking into the top-left pocket of the net. The River Hawks pressed hard throughout the game, outshooting the Friars 13-10 in the second and creating a great deal of traffic in the third. 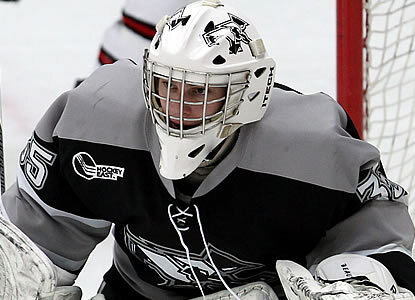 Providence stood tall to the task, blocking seven shots in the third while Alex Beaudry (Cumberland, Ont.) collected his third shutout of the season with 29 total saves. UMass Lowell's Carr was tremendous in net, stopping 35-of-36 shots on the night--including 14 saves in the third period to keep the team in the game. He drops to 21-9-1 on the season. Each club earned just one power play on the night, both coming in the second period, playing 56 minutes of the game at even strength.